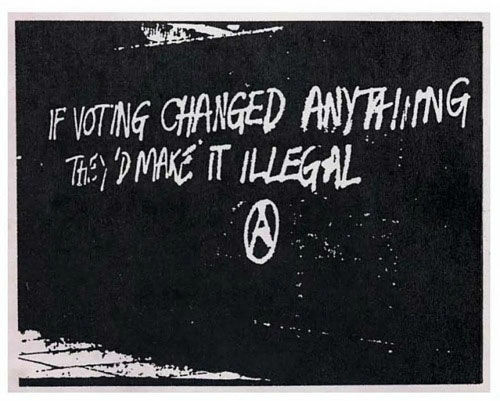 Don’t vote. It just encourages them? It’s election day 2015. Politicians are, depending on the colours of their allegiance, either about to start weeping into their espresso or taking a pull on another celebratory pint of bitter. In the European elections last year, Marine Le Pen’s Front National topped a nationwide poll for the first time ever. The UK front pages nearly all carried photos of Nigel Farage with a grin as wide as the channel tunnel. The political establishment had its arse very firmly kicked. Is this what people really think? David Cameron said that voters are “disillusioned” with the EU. A Lib Dem commentator said that Nick Clegg needs to quit because voters are no longer prepared to listen to him. I fear they’re deluding themselves. This wasn’t about the EU or Cleggy, this was about people’s view of politics and politicians. It’s also, fundamentally, about who’s talking and who’s listening. Who’s talking? Who’s listening? The 36% UK turnout tells its own story. People are giving up on conventional democracy because ticking a box once every few years doesn’t really constitute a conversation between equals. And that’s what they get in most other areas of their lives. Only the way they’re governed (and, less so, the way they’re employed) is still so autocratic. Politicians aren’t talking about what voters are interested in and voters aren’t interested in what politicians are talking about. And when people do talk, politicians don’t listen. Letters get batted back with delegated, form answers and the real questions unanswered. The results of consultations seem pre-decided. Protests are increasingly ignored. We don’t really need elected representatives. We are now better informed, educated and connected thanks to the internet. Direct local democracy is possible and indeed, becoming more common. People can contact their local representatives, take part in consultations and lobby as never before. But their participation is still very much for form’s sake and, because of that, only a minority take part. Worse, most politicians seem to either fear or ignore this participation. We’ve moved on in so many other areas. We choose our own direct, fragmented media, the news we read, the subjects we engage with, the style of reporting we want. Why shouldn’t we do the same with politics? Labour, LibDems, Conservatives – even UKIP – are becoming as irrelevant and archaic as just four channels of terrestrial television. Democracy still consists of a pre-internet model where a few groups of people give pre-determined answers to a set of vague, general questions and ask people to elect them on that basis. Doesn’t it make more sense to ask the people the real, live questions directly and let them answer? If we don’t begin to do this and educate the electorate (that’s all of us) to do so, ‘four channel’ party politics will continue down its slope to irrelevance. 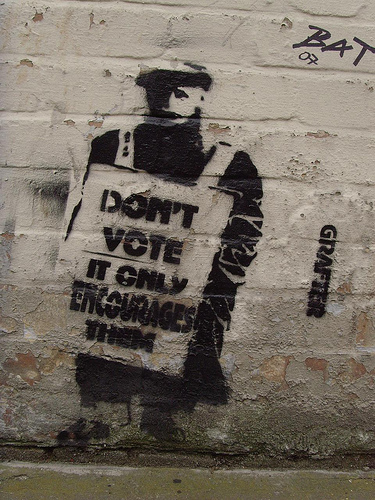 If people believed their vote might actually affect their lives, we’d start to see people becoming engaged in politics. So get out there and vote. We’re not going to change anything from outside the room. → The one watch I’ll never sell. Those words stayed with me ever since. I have voted from time to time, but the outcome was always the same no matter who took office. Was Bill right? We talk about living in a democratic society, but as ever, someone will lose out against the majority. They can live with it and adapt, challenge it and fight back, or appear to go with the flow and keep their head down. Ever since the “information super highway” as Tony Blair dubbed it, we, the individuals of this and most other nations, have had access to information as never before. There are groups and forums on anything under the Sun – politics included. We have learned that when Edward Heath took us into what he called “The Common Market” no average person had any idea of what it would lead to other than better and easier trade with Europe. What he did not tell the population at large was that in doing so this countries sovereignty would be signed away, in fact. Heath denied any such thing was involved. He lied. I could go on about Magna Carta and the Bill of Rights, but there are other places where these things are better described in detail. In short, many of our Ministers of the Crown are traitors in supporting – and continuing to cover up the wrong doings that went on back in 1972 and before. In essence, there is a very real historic reason why we are not lawfully a part of the EU. But that doesn’t stop the charade being forced along with bluff and bluster, and all the expenses and perks that go with it. We have a judiciary that is corrupt. A Police force that is Corrupt. Politicians who are corrupt. Main stream media that is corrupt. In such an environment – who do you turn to? The answer is: in other like minded souls who have collected and distributed information outside of the mainstream channels. Then you get a new image of our world appearing – and it is a global image not just national. With regard to the recent elections, in one poll, None Of The Above (NOTA, that is none of the available parties listed as candidates) scored 65.8%, followed by UKIP at 9.4%; Labour 8.7%, Conservatives 8.2% and we can forget the rest. In fact we can forget any of it, for as far as Jolly Old, beer drinking, tea swilling, placid Old England will be affected by these results, the only certainty is that we will sit back and think of England as it once was – historic, Monarchic, industrious. It will be the Continentals who will disseminate and de-construct the monster that has engulfed national pride and businesses in each and every part of the political Eurozone. In the face of this deconstruction, the Euro Kommissars will spout forth just so much propaganda – just like Saddam Hussein’s information Minister, Muhammed Saeed al-Sahaf, – on how all is well, we are in control, there is nothing to worry about. It will collapse. But under any forthcoming political regime change in this country – it will be situation normal, no matter what. It’s not the politicians who are/were in control, it is ‘they’ who are controlled by the senior civil servants – nobody anyone ever voted for. And if you could vote them out – they’d ban it – their global support construct would see to that.